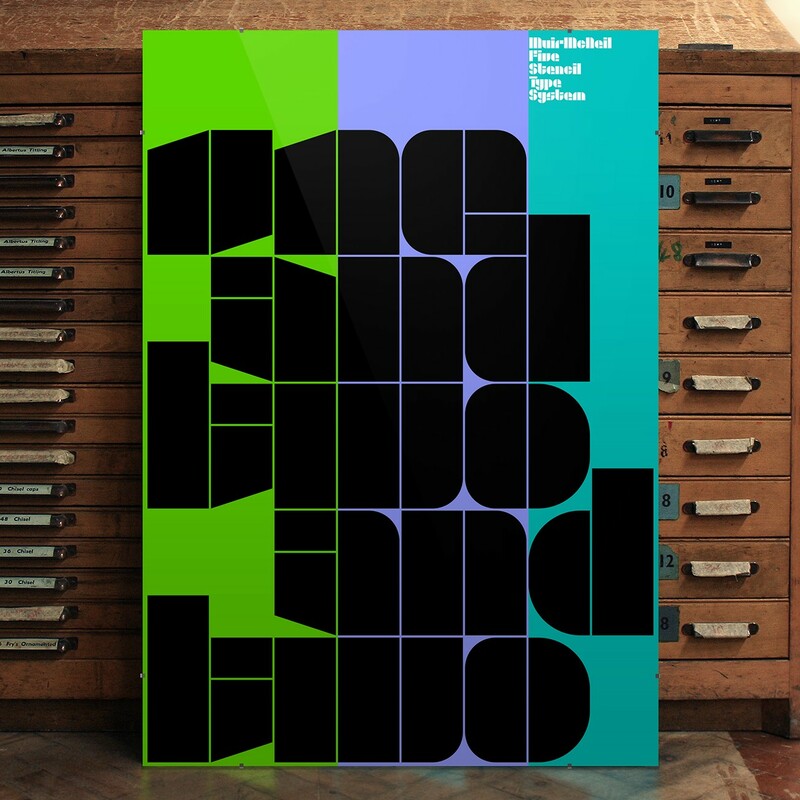 MuirMcNeil Five is a stencil type system constructed from basic geometric segments. It explores two essential typographic features. Relationships between form and counter form are fundamental to all visual communication processes. In the context of typeface design, readers are able to distinguish one letter from another not solely by means of the shapes of the strokes from which they are made but the formation of the spaces between them. In MuirMcNeil Five, the structure of letterforms is differentiated primarily through exchanges of linear intervals between letters and strokes rather than by means of external profiles alone. Instead of constructing glyphs from a minimal set of strokes in the conventional manner, Five is built around a minimal set of internal spaces throughout. These have been reduced to thin white hairlines in all but the ExtraFat weight, resulting in optimally dense and imposing alphabets. This approach references the linear void spaces of stencil designs such as Josef Albers’ Kombinations-Schrift, along with those of compressed rectilinear sans serifs from the 1960s such as Compacta, Helvetica Inserat and Impact, faces that were themselves modelled on Walter Haettenschweiler’s seminal Schmalfette Grotesk from 1954. A second strategy has been explored in MuirMcNeil Five. To facilitate visual differentiation between characters with minimum intervention, the core of the lower case, from baseline to x-height, divides into either two or three horizontal sections. Following principles similar to those used by Walter Ballmer in his logo and lettering designs for Olivetti in 1971, this allows stroke proportions to be modulated more subtly and more naturally than in many constructed types. MuirMcNeil Five is available in OpenType as a display family in three styles each in four bold weights.